Automaster Paint & Body Works is proud to offer a full range of garage services to vehicle owners located in the greater Dunkirk area. 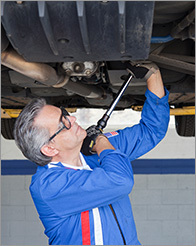 Below is a list of our most popular garage services. If the service you are looking for is not listed here, or if you would like more information on any of our services, please do not hesitate to contact us today. Automaster Paint & Body Works will gladly offer pricing information on any of these Dunkirk Garage services. We also offer repair and maintenance packages for your convenience, and our prices and level of workmanship can not be beaten in the Dunkirk area so contact us today!